These peanut butter spider cookies are so creepy and delightful for the Halloween day party. Yes these are slightly sweet, a bit salt cookies with a nutty flavor and taste. Super soft, tasty and it does looks frightful. I have referred here for the recipe and i modified the recipe to an egg less version. It is quite easy to prepare and is with less calories. I'm sure everyone is going to love this cookie for its looks as well as for the nutty taste. Making these cookies are fun and for others (especially kids) it sure is frightful. It is an easy to bake recipe for the Halloween party. Preheat the oven to 180 degree for 10 minutes. In a bowl take the softened butter and peanut butter. Beat well using a whisk or spoon. Add the powdered sugar and vanilla essence. Mix well again. In a separate bowl add the all purpose flour, baking powder and baking soda and salt; Mix well. Add the flour mixture into the butter mixture in two batches and mix well. From the dough roll 12 even sized round balls. Spread a baking paper on top of baking tray and keep the cookie balls over it. Again place the tray on oven and bake the cookies to 10-15 minutes or until the cookies starts to get golden colour. Remove the cookies from oven and allow to cool. When its warm keep the chocolate balls inside the dimple to stick with the cookie (Do not keep when the cookies are hot as it would melt the chocolate). In the microwave oven melt the chocolate chips for 30 to 40 minutes. Stopping at each 10 seconds and stirring to avoid burning. Keep the eyes of the spider using sugar pearls or candy eyes on the chocolate balls by pressing them or glue them using melted chocolate. Mark eye balls using black or brown food color if you use sugar pearls. This step is optional you can leave it as such. Transfer the melted chocolate in to a piping bag or zip lock bag and snip the edge and pipe the legs for the spider. aawesome! these look sooo cute!! Perfect for halloween party, looks really cute.. They don't look one bit scary such cute spiders.i'll sing itsy bitsy spider too!!! 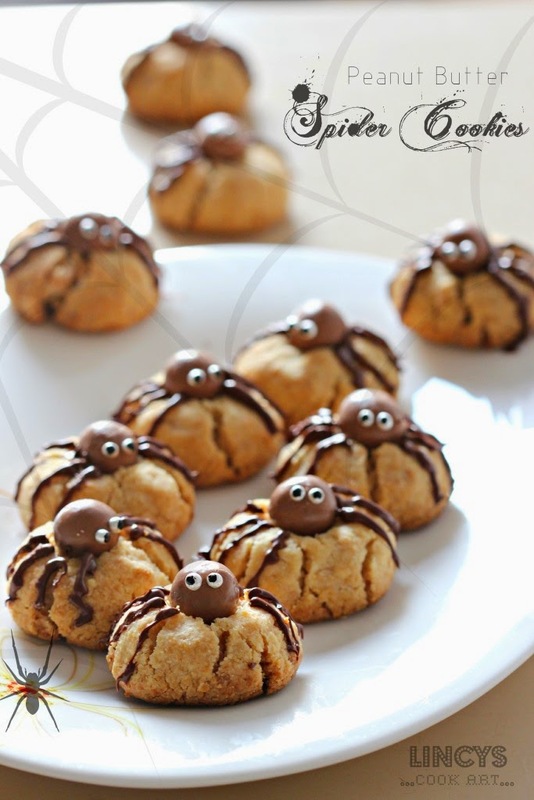 These peanut butter spider cookies looks so cute.. and delicious too, I almost would not want to eat or destroy them! These look fabulous and not so spooky you wouldn't want to eat them. Looks awsum spider cookies !